This book was set by GGS Book Services. It was printed and bound by R. R. Donnelley & Sons Company. The cover was printed by Phoenix Color Corp. 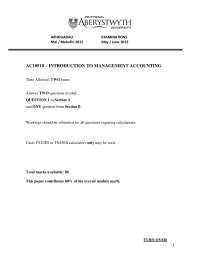 Copyright © 2008, 2004, 2001, 1998, 1996, 1991 by Pearson Education, Inc., Upper Saddle River, New Jersey 07458. Pearson Prentice Hall. All rights reserved. Printed in the United States of America. This publication is protected by Copyright and permission should be obtained from the publisher prior to any prohibited reproduction, storage in a retrieval system, or transmission in any form or by any means, electronic, mechanical, photocopying, recording, or likewise. For information regarding permission(s), write to: Rights and Permissions Department. Pearson Prentice Hall™ is a trademark of Pearson Education, Inc. Pearson® is a registered trademark of Pearson plc. Pearson Hall® is a registered trademark of Pearson Education, Inc.
Pearson Education Ltd. Pearson Education Australia Pty. Limited Pearson Education Singapore Pte. Ltd. Pearson Education North Asia Ltd. Pearson Education Canada, Ltd. Pearson Educación de Mexico, S.A. de C.V. Pearson Education—Japan Pearson Education Malaysia Pte. 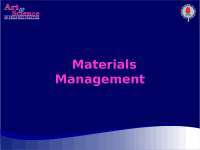 Ltd.
Introduction to Materials Management is an introductory text written for students in community colleges and universities. It is used in technical programs, such as indus- trial engineering and manufacturing engineering; in business programs; and by those already in industry, whether or not they are working in materials management. This text has been widely adopted by colleges and universities not only in North America but also in other parts of the world. APICS—The Association for Operations Management recommends this text as the reference for certification preparation for various CPIM examinations. 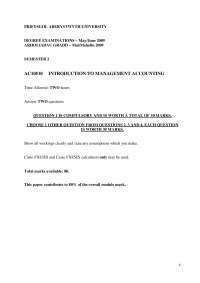 In addition, the text is used by produc- tion and inventory control societies around the world, including South Africa, Australia, New Zealand, Germany, France, and Brazil, and by consultants who pre- sent in-house courses to their customers. Introduction to Materials Management covers all the basics of supply chain man- agement, manufacturing planning and control systems, purchasing, and physical dis- tribution. The material, examples, questions, and problems lead the student logically through the text. The writing style is simple and user-friendly—both instructors and students who have used the book attest to this. Materials management means different things to different people. In this textbook, materials management includes all activities in the flow of materials from the supplier to the consumer. Such activities include physical supply, operations planning and con- trol, and physical distribution. Other terms sometimes used in this area are business logistics and supply chain management. Often, the emphasis in business logistics is on transportation and distribution systems with little concern for what occurs in the fac- tory. Whereas some chapters in this text are devoted to transportation and distribu- tion, emphasis is placed on operations planning and control. Distribution and operations are managed by planning and controlling the flow of materials through them and by using the system’s resources to achieve a desired customer service level. These activities are the responsibility of materials manage- ment and affect every department in a manufacturing business. If the materials management system is not well designed and managed, the distribution and manufac- turing system will be less effective and more costly. Anyone working in manufacturing or distribution should have a good basic understanding of the factors influencing materials flow. This text aims to provide that understanding. APICS defines the body of knowledge, concepts, and vocabulary used in pro- duction and inventory control. Establishing standard knowledge, concepts, and vocabulary is essential both for developing an understanding of production and inventory control and for making clear communication possible. Where applicable, the definitions and concepts in this text subscribe to APICS vocabulary and concepts. 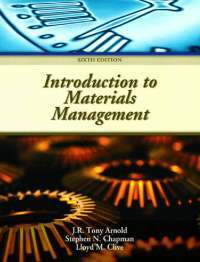 The first six chapters of Introduction to Materials Management cover the basics of production planning and control. Chapter 7 discusses important factors in purchasing and supply chain; Chapter 8 discusses forecasting. 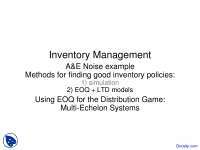 Chapters 9, 10, and 11 look at the fundamentals of inventory management. Chapter 12 discusses physical inventory and warehouse management, and Chapter 13 examines the elements of dis- tribution systems, including transportation, packaging, and material handling. Chapter 14 covers factors influencing product and process design. Chapter 15 looks at the philosophy and environment of just-in-time and lean production and explains how operations planning and control systems relate to just-in-time and lean production. Chapter 16 examines the elements of total quality management and Six Sigma quality approaches. To access supplementary materials online, instructors need to request an instructor access code. Go to www.prenhall.com, click the Instructor Resource Center link, and then click Register Today for an instructor access code. Within 48 hours after regis- tering you will receive a confirming e-mail including an instructor access code. Once you have received your code, go to the site and log on for full instructions on down- loading the materials you wish to use. Help and encouragement have come from a number of valued sources, among them friends, colleagues, and students. We thank the faculty of other colleges and the many members of APICS chapters who continue to offer their support and helpful advice. Many thanks to those who reviewed the fifth edition and provided suggestions for the sixth edition, including members of the APICS Basics of Supply Chain Management Certification Committee: Jim Caruso (Chair) of Tyco Healthcare; Carol Bulfer, Parker Hanninfin Corp.; William Leedale, IFS; and Angel Sosa, University of Puerto Rico at Bayamon. Academic reviewers included Sheila E. Rowe, North Carolina A&T State University; David Lucero, Greenville Technical College; Floyd Olson, Utah Valley State College; Ralph G. Kauffman, University of Houston—Downtown; Ronald J. Baker, Shoreline Community College; and Richard E. Crandall, Appalachian State University. Tony Arnold thanks his wife, Vicky Arnold, for her assistance throughout the years of writing and revising this text, and Steve Chapman thanks his wife, Jeannine, for her support as well. Lloyd Clive thanks his wife, Kathleen, for her continued support. Overall, this book is dedicated to those who have taught us the most—our students. The wealth of a country is measured by its gross national product—the output of goods and services produced by the nation in a given time. Goods are physical objects, something we can touch, feel, or see. Services are the performance of some useful function such as banking, medical care, restaurants, clothing stores, or social services. But what is the source of wealth? It is measured by the amount of goods and services produced, but where does it come from? Although we may have rich natural resources in our economy such as mineral deposits, farmland, and forests, these are only potential sources of wealth. A production function is needed to transform our resources into useful goods. Production takes place in all forms of transformation— extracting minerals from the earth, farming, lumbering, fishing, and using these resources to manufacture useful products. There are many stages between the extraction of resource material and the final consumer product. At each stage in the development of the final product, value is added, thus creating more wealth. If ore is extracted from the earth and sold, wealth is gained from our efforts, but those who continue to transform the raw material will gain more and usually far greater wealth. Japan is a prime example of this. It has very few natural resources and buys most of the raw materials it needs. However, the Japanese have developed one of the wealthiest economies in the world by transform- ing the raw materials they purchase and adding value to them through manufacturing. Manufacturing companies are in the business of converting raw materials to a form that is of far more value and use to the consumer than the original raw materi- als. Logs are converted into tables and chairs, iron ore into steel, and steel into cars and refrigerators. This conversion process, called manufacturing or production, makes a society wealthier and creates a better standard of living. To get the most value out of our resources, we must design production processes that make products most efficiently. Once the processes exist, we need to manage their operation so they produce goods most economically. Managing the operation means planning for and controlling the resources used in the process: labor, capital, and material. All are important, but the major way in which manage- ment plans and controls is through the flow of materials. The flow of materials con- trols the performance of the process. If the right materials in the right quantities are not available at the right time, the process cannot produce what it should. Labor and machinery will be poorly utilized. The profitability, and even the existence, of the company will be threatened. Operations management works in a complex environment affected by many factors. Among the most important are government regulation, the economy, competition, customer expectations, and quality. Government. Regulation of business by the various levels of government is exten- sive. Regulation applies to such areas as the environment, safety, product liability, and taxation. Government, or the lack of it, affects the way business is conducted. Economy. General economic conditions influence the demand for a company’s products or services and the availability of inputs. During economic recession the demand for many products decreases while others may increase. Materials and labor shortages or surpluses influence the decisions management makes. Shifts in the age of the population, needs of ethnic groups, low population growth, freer trade between countries, and increased global competition all contribute to changes in the marketplace. Competition. Competition is severe today. • Manufacturing companies face competition from throughout the world. They find foreign competitors selling in their markets even though they themselves may not be selling in foreign markets. Companies also are resorting more to worldwide sourcing. • Transportation and the movement of materials are relatively less costly than they used to be. • Worldwide communications are fast, effective, and cheap. Information and data can be moved almost instantly halfway around the globe. The Internet allows buyers to search out new sources of supply from anywhere in the world as easily as they can from local sources. • A fair price. • Higher-(right) quality products and services. • Delivery lead time. • Better presale and after-sale service. • Product and volume flexibility. Quality. Since competition is international and aggressive, successful companies provide quality that not only meets customers’ high expectations but exceeds them. Chapter 16 discusses quality in detail. Order qualifiers and order winners. Generally a supplier must meet set mini- mum requirements to be considered a viable competitor in the marketplace. Customer requirements may be based on price, quality, delivery, and so forth and are called order qualifiers. For example, the price for a certain type of product must fall within a range for the supplier to be considered. But being considered does not mean winning the order. To win orders a supplier must have characteristics that encourage customers to choose its products and services over competitors’. Those competitive characteristics, or combination of characteristics, that persuade a company’s cus- tomers to choose its products or services are called order winners. They provide a competitive advantage for the firm. Order winners change over time and may well be different for different markets. For example, fast delivery may be vital in one market but not in another. Characteristics that are order winners today probably will not remain so, because competition will try to copy winning characteristics, and the needs of customers will change. It is very important that a firm understands the order winners and order quali- fiers for each of their products and in each of their markets because they should drive the manufacturing strategy. Since it is virtually impossible to be the best in every dimension of competition, firms should in general strive to provide at least a minimal level of acceptance for each of the order qualifiers but should try to be the best in the market for the order winner(s). Figure 1.1 Manufacturing strategy and lead time. implies that most products go through a life cycle, including introduction, growth, maturity, and decline. For example, in the introduction phase, design and availability are often much more important than price. Quality and delivery tend to have increased importance during growth, while price and delivery are often the order winners for mature products. This life cycle approach is complicated in that the dura- tion of the life cycle will be very different for different products. Although some prod- ucts have life cycles many years long, other products (certain toys or electronics, for example) can be measured in months or even weeks. A highly market-oriented company will focus on meeting or exceeding customer expectations and on order winners. In such a company all functions must contribute toward a winning strategy. Thus, operations must have a strategy that allows it to supply the needs of the marketplace and provide fast on-time delivery. Delivery lead time. From the supplier’s perspective, this is the time from receipt of an order to the delivery of the product. From the customer’s perspective it may also include time for order preparation and transmittal. Customers want delivery lead time to be as short as possible, and manufacturing must design a strategy to achieve this. There are four basic strategies: engineer-to-order, make-to-order, assemble-to- order, and make-to-stock. Customer involvement in the product design, delivery lead time, and inventory state are influenced by each strategy. Figure 1.1 shows the effect of each strategy. involved in the product design. Inventory will not normally be purchased until needed by manufacturing. Delivery lead time is long because it includes not only purchase lead time but design lead time as well. Make-to-order means that the manufacturer does not start to make the product until a customer’s order is received. The final product is usually made from standard items but may include custom-designed components as well. Delivery lead time is reduced because there is little design time required and inventory is held as raw material. Assemble-to-order means that the product is made from standard components that the manufacturer can inventory and assemble according to a customer order. Delivery lead time is reduced further because there is no design time needed and inventory is held ready for assembly. Customer involvement in the design of the prod- uct is limited to selecting the component part options needed. Make-to-stock means that the supplier manufactures the goods and sells from finished goods inventory. Delivery lead time is shortest. The customer has little direct involvement in the product design. customer may have several suppliers and may in turn supply several customers. As long as there is a chain of supplier/customer relationships, they are all members of the same supply chain. • The supply chain includes all activities and processes to supply a product or service to a final customer. depending on the products and markets, it can contain a number of intermedi- aries (distributors) such as wholesalers, warehouses, and retailers. • Product or services usually flow from supplier to customer and design, and demand information usually flows from customer to supplier. Rarely is this not so. Although these systems vary from industry to industry and company to company, the basic elements are the same: supply, production, and distribution. The relative importance of each depends on the costs of the three elements. In recent years there has been a great deal of attention to the concept of supply chain management (SCM). It is important to understand the fundamental issues behind this movement, as well as the impact on materials management. Historical perspective. In the past, many company managers placed most of their attention on the issues that were internal to their companies. Of course they were aware of the impact of suppliers, customers, and distributors, but those entities were often viewed as business entities only. Specialists in purchasing, sales, and logistics were assigned to “deal” with those outside entities, often through formal legal con- tracts that were negotiated regularly and represented short-term agreements. For example, suppliers were often viewed as business adversaries. A key responsibility of a purchasing agent was to negotiate the best financial and delivery conditions from a supplier, whose job was to maximize his company’s profit. Organization theorists often called the functions that dealt with outside entities boundary spanners, indicat- ing that for most people in the organization there were well-defined and rigid bound- aries between their organization and the rest of the world. 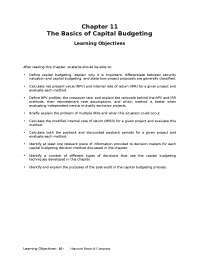 • Mutual analysis for cost reduction. Both parties examined the process used to transmit information and deliver parts, with the idea that cost reductions would be shared between the two parties. • Mutual product design. In the past the customer often submitted complete designs to the supplier who was obligated to produce according to design. With partnering, both companies worked together. Often the supplier would know more about how to make a specific product, whereas the customer would know more about the application for which the design was intended. Together, they could probably produce a superior design compared to what either could do alone. • With JIT, the concept of greatly reduced inventory in the process and the need for rapid delivery according to need, the speed of accurate information flow became critical. Formal paper-based systems gave way to electronic data inter- change and informal communication methods. • There has been explosive growth in computer capability and associated soft- ware applications. Highly effective and integrated systems such as enterprise resource planning (ERP) and the ability to link companies electronically (through the Internet, for example) have allowed companies to share large amounts of information quickly and easily. The ability to have the information rapidly has become a competitive necessity for many companies. • There has been a large growth in global competition. Very few companies can still say they have only local competition, and many of the global competi- tors are forcing existing companies to find new ways to be successful in the marketplace. • There has been a growth in technological capabilities for products and processes. Product life cycles for many products are shrinking rapidly, forcing companies to not only become more flexible in design but also to communicate changes and needs to suppliers and distributors. • The changes prompted by JIT in the 1980s have continued to mature, so that by now many companies have new approaches to interorganizational relationships as a normal form of business. • Partially in response to the preceding conditions, more and more companies are subcontracting more of their work to suppliers, keeping only their most impor- tant core competencies as internal activities. 1. Flow of materials. 2. Flow of information and sharing of information, mostly through the Internet. 3. Fund transfers. What is illustrated here is but one chain of a set of different component chains that represent a network of suppliers and distributors for a product. To manage a supply chain, one must not only understand the network of suppli- ers and customers along the chain but must also try to efficiently plan material and information flows along each chain to maximize cost efficiency, effectiveness, delivery, and flexibility. This clearly not only implies taking a different conceptual approach to suppliers and customers but also implies a highly integrated information system and a different set of performance measures. Overall, the key to managing such a concept is with rapid flows of accurate information and increased organizational flexibility. considering the effect they would have on other parts of the system. Because the three systems are interrelated, conflicts often occurred. Although each system made decisions that were best for itself, overall company objectives suffered. For example, the transportation department would ship in the largest quantities possible so it could minimize per-unit shipping costs. However, this increased inventory and resulted in higher inventory-carrying costs. 1. Provide best customer service. 2. Provide lowest production costs. 3. Provide lowest inventory investment. 4. Provide lowest distribution costs. These objectives create conflict among the marketing, production, and finance departments because each has different responsibilities in these areas. • Reduce inventory so inventory investment is at a minimum. • Decrease the number of plants and warehouses. • Produce large quantities using long production runs. • Manufacture only to customer order. • Make long production runs of relatively few products. Fewer changeovers will be needed and specialized equipment can be used, thus reducing the cost of making the product. • Maintain high inventories of raw materials and work-in-process so production is not disrupted by shortages. These conflicts among marketing, finance, and production center on customer service, disruption of production flow, and inventory levels. Figure 1.3 shows this relationship. Today the concepts of JIT manufacturing stress the need to supply customers with what they want when they want it and to keep inventories at a minimum. These objectives put further stress on the relationship among production, marketing, and finance. Chapter 15 will discuss the concepts of JIT manufacturing and how it influ- ences materials management. One important way to resolve these conflicting objectives is to provide close coordination of the supply, production, and distribution functions. The problem is to balance conflicting objectives to minimize the total of all the costs involved and max- imize customer service consistent with the goals of the organization. This requires some type of integrated materials management or logistics organization that is responsible for supply, production, and distribution. Rather than having the planning and control of these functions spread among marketing, production, and distribution, they should occur in a single area of responsibility. The concept of having one department responsible for the flow of materials, from supplier through production to consumer, is relatively new. Although many compa- nies have adopted this type of organization, there are still a number that have not. If companies wish to minimize total costs in this area and provide a better level of customer service, they will move in this direction. 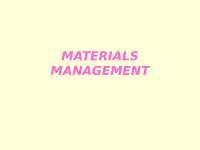 The name usually given to this function is materials management. Other names include distribution planning and control and logistics management, but the one used in this text is materials management. • Maximize the use of the firm’s resources. • Provide the required level of customer service. Direct labor and direct material are costs that increase or decrease with the quantity sold. Overhead (all other costs) does not vary directly with sales. For sim- plicity this section assumes overhead is constant, even though it is initially expressed as a percentage of sales. Profit has been increased by 60%. To get the same increase in profit ($60,000) by increasing revenue, sales would have to increase to $1.2 million. a. If the cost of direct material is 60%, direct labor is 10%, and overhead is 25% of sales, what will be the improvement in profit if direct material is reduced to 55%? Sales must increase 17% to give the same increase in profit. Inventory not only makes up a portion of the cost of goods sold but has to be purchased at the beginning of production to be processed into finished goods. This type of inventory is called work-in-process (WIP). WIP is a major investment for many companies, and reducing the amount of time that inventory spends in production is a good way to reduce the costs associated with this investment. Labor, materials and overhead are applied to goods continuously throughout production and the value of the WIP is estimated to be one half the final value. Further discus- sion on WIP and reducing it is covered in Chapters 9 and 15.
tory was 20% of the inventory value, what would be the annual savings?